Recently 110 helicopters headed out of Fort Rucker, Ala., to avoid storm damage that might come from Hurricane Irma, said Maj. Gen. Bill Gayler. Gayler, who serves as commander of the U.S. Army Aviation Center of Excellence, spoke at the Association of the United States Army’s Army Aviation Hot Topic forum. 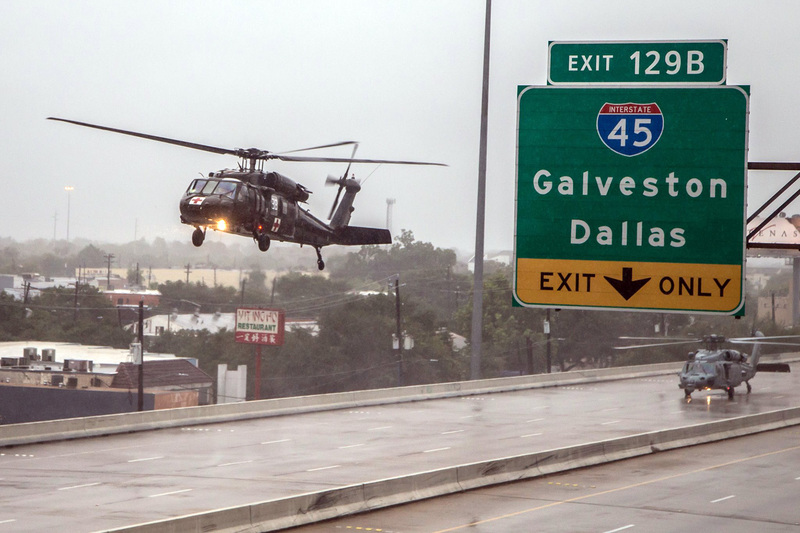 Even as those helicopters are moved to safety, Army National Guard aviation assets from 20 states are still in Texas and Louisiana, assisting with recovery efforts there, post-Hurricane Harvey, he said. Those missions, while vital and in the current spotlight, are just a drop in the bucket so to speak, of Army aviation’s global commitments, Gayler noted. In all, an astonishing 88 percent of all Army aviation assets are committed, he said, explaining that “committed” is defined as actively participating in operations or training missions. Those commitments include training missions at the combat training centers as well as the several combat aviation brigades operationally deployed to Afghanistan, Iraq, Kuwait, Korea and Europe. In Europe, he said, units are stretched from Estonia to Romania. Gayler, who participated in Operation Desert Storm, recalled that at that time, Army aviation consisted of about 9,000 helicopters. Today, that number is less than 4,000. The Army of today, Gayler said, is doing a lot of heavy lifting with a lot less rotor-winged lifting power. Looking ahead, Gayler said he sees those commitments continuing to grow in coming years, even though the Army’s budget took a nosedive following sequestration, and with eight years of back-to-back continuing resolutions. Maj. Gen. John A. George, who serves as director of force development with the Army G-8, put into context the effect of continuing resolutions on Army aviation. The Army currently has no new programs in the works for aviation – that is, there are no completely new aircraft systems planned for the Army. But even if there were new programs in the works, Gayler said that historically as new programs make their way through the various phases of development and acquisition to eventual production, it can take 40 years to completely field a new system. In effect, as technology progresses, “we are fielding obsolescence,” he candidly said. The mindset needs to change to “introducing new capability, not replacing legacy systems,” he said. Currently, with the Army not buying new helicopters, the strategy is to make incremental improvements to existing platforms, he said. One of the problems with that approach is that the increments usually require that the helicopter be taken off the flight line and sent to the manufacturer for the install. That process is bringing U.S. Army Forces Command “to its knees,” he said. He explained that the non-availability of those aircraft means that combatant commanders don’t have the lift needed to perform essential missions. The solution, he said, is for the Army to insist on “plug and play” standards that allow increments to be installed without taking the aircraft away from its unit. If and when the Army does get the funds needed to acquire new aircraft, Gayler said the requirements should be flexible enough to do a smart cost-benefit analysis of the tradeoffs that result in an effective aircraft that may not be perfect in terms of everything – range, speed, lift, size, fuel consumption, survivability, lethality and cost. The entire range of capabilities need to be understood in the context of the threats and future threats, rather than single variables, he said.